Synchronize all the personal data between your Gmail and Outlook accounts by applying transfer protocols linking two clients and cross-checking the settings of time and date, contacts, company names, phone numbers, addresses, emails, notes, contact pictures, groups, and categories. 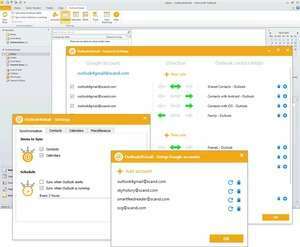 Outlook4Gmail is a free must-have Outlook add-in providing easy contacts synchronization of your Outlook and Gmail accounts and address books. This add-in uses the maximum correspondence of Outlook and Gmail contact details: Name, Company, Phones, Emails, Addresses, Dates, Persons, Notes, etc. You define the direction of synchronization/update: you can sync or update either the Outlook or the Gmail address book (one-way synchronization) or choose to update both accounts simultaneously (two-way synchronization). Version 5.1.1 is a freeware program which does not have restrictions and it's free so it doesn't cost anything. For security reasons, you should also check out the Outlook4Gmail download at LO4D.com which includes virus and malware tests. Additional screenshots of this application download may be available, too. Providing access to the best free Windows Email tools. Software titles in Email Tools are updated constantly and provided along with a review by the editors. Check out some of the freeware downloads available in the email client category. They contain no strings and are available at zero cost.